Our Products >> 150ft. HO scale Punchplate Bridge Kit. 150ft. 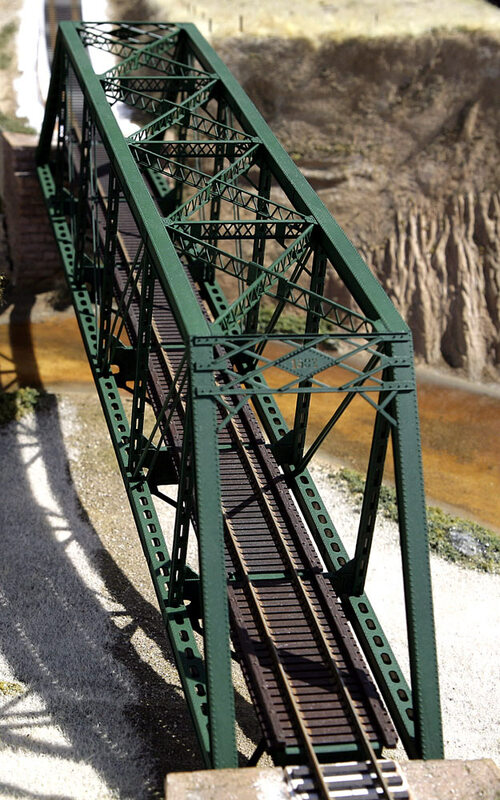 HO scale Punchplate Bridge Kit. Born of the Midwest, also from the early1900’s, is our highly functional HO scale Punch Plate Girder Bridge, that is a beauty to behold just like her sisters and she will look fabulous on any layout. She is another super detailed HO bridge that we are proud to have in our family of bridges. This bridge is a wonder for all to have and see even if you don’t own a layout, she would look great up on a book shelf or fireplace. The Punchplate girders included with this kit, can be purchased separately in a package of 5 for custom building many different steel structures and bridges. The model as built from the plans spans 21 inches. It is approximately 4 3/8 inches high and 2 7/8 inches wide. From rail-head to bottom of shoe is approximately 15/16 inches. The parts are injection molded of an impact grade of styrene plastic that is the same as used in the popular automobile and military hobby kits. Cementing and painting requires the same materials and techniques in common use in the construction of those kits and the most popular model railroad kits. The bridge kit components are ideal for kit bashing and the scratch building of other bridges and steel structures. There is no prototype bridge that the kit was copied from. It is a very common and typical design that is used in North America and even other parts of the world. Some are still in use and many subtle variations are possible. Modifications in bracing, rail, guard-rails, walkways and railings, telegraph arms attached, and different portals are common. They are most often painted black, but there are examples of silver, gray, red oxide and green.